offers an authentic rural experience in Rajasthan. Come explore the wonders and sites that Dausa has to offer you. There’s always something to see in Rajasthan. Abhaneri 88 kms from Jaipur on the Jaipur-Agra road is another attraction of Dausa, it is believed to be established by Raja Chandra. Originally named as Abha Nagri which means the city of brightness due to mispronunciation it is now called as Abhaneri. The Department of Tourism hosts a wonderful two-day “Abhaneri Festival” promoting heritage tourism in the area. Cultural performances and village camel safari are the main attractions of the festival. One of the popular places to visit in Abhaneri is the Chand Baori (stepwell). Built back in the eighth century, it is one of the deepest and largest step wells in India. The phenomenal structure is 19.5 meters in depth and features 1000 narrow steps, spanning 13 storeys. Located 33 kms from Dausa adjacent to the Chand Baori is a temple dedicated to Harshat Mata – the goddess of joy and happiness. As per the legends, the goddess is always cheerful and showers the people with blessings of joy and happiness. Its magnificent architecture and sculptural styles are a delight for the eyes! Jhajhirampura is famous for its natural water tank as well as the temples of Rudra (Shiv), Balaji (Hanuman), and other gods and goddesses. It is situated around 45 km away from the district headquarters, towards Baswa (Bandikui). Surrounded by hills and water resources, this place has natural and spiritual glory. Bhandarej is located about 65 km from Jaipur, on the Jaipur-Agra highway, and about 10 km from Dausa. Bhandarej, during Mahabharata times, was known as Bhadrawati. The walls, sculptures, decorative lattice work jaalis, terracotta utensils, etc., found in excavations, speak volumes about the ancient splendor of this place. The Bhandarej Baori (step-well) and Bhadrawati Palace are popular places to visit,and are fine examples of the grand history of the region. Its history can be traced back to the 11 th century, when the Kachhawaha Chieftan Dulha Rai defeated the Bargujars and conquered Bhandarej. The region is also famous for carpet making. The village of Lotwara is located 110 Km from Jaipur. The biggest attraction of this village is the Lotwara Garh(Fort), which was built by Thakur Ganga Singh in the 17 th century, as well as the large population of peacocks in the village. How to reach Lotwara? Located just 11 Km from Abhaneri, the best way to reach the village is by road. The Roman style Church for Protestant Christians is a popular attraction in Bandukui, located about 35 Km from Dausa. Temple of Bajrang Bali (Lord Hanuman) is famous for treatment of mentally unbalanced people by the Pretraj. Despite tremendous growth in the medical science in the World, people from all over India still come to get themselves cured here. This temple is 50kms away from Dausa has a lot of religious significance. Be a part of the festivities and traditions that Dausa has to offer. It’s always a celebration in Rajasthan. ‘Abhaneri festival’ is named after the village Abhaneri in the Dausa district which is around 90 km from Jaipur on the Agra road. This two-day festival has gained immense popularity amongst the tourists around the globe. This year, it will commence from 11th to 12th October with various Rajasthani & local folk performances like Kachhi Ghori, Kalbeliya, Ghoomar, and Bhawai. Festival was initiated by Rajasthan Tourism in 2008, it is of great significance for Rajasthan. The village of Abhaneri was originally named Abha Nagri, meaning "city of brightness”. The place is popular for the Chand Baori-step well, one of the largest step wells built over a thousand years ago. Be a part of the celebrations at Abhaneri and dip into the rustic charm of traditional Rajasthani music. 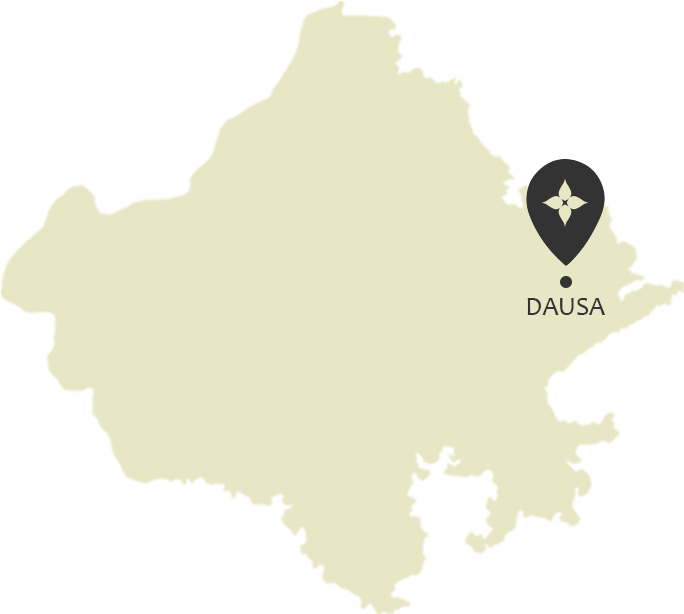 Engage in the many activities, tours and adventures that await you in Dausa. There’s always something to do in Rajasthan. The Jaipur Airport is the closest and is located 62 kilometres away. You can hop on to a bus from Jaipur and get here. Dausa is well connected to Jaipur by rails.